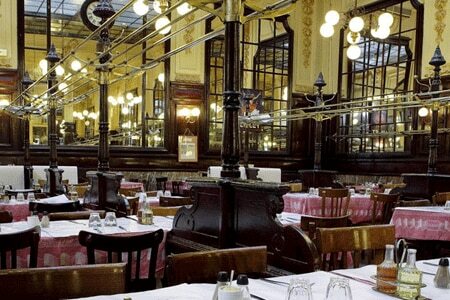 Bought by Gérard Joulie in 2008, this Paris institution has retained its reputation as one of the great Art Nouveau brasseries. : Opened in 1896, Bouillon Chartier is listed in the supplementary inventory of the Monuments Historiques (National Heritage Sites). Bought by Gérard Joulie in 2008, the restaurant has retained its reputation as one of the great Art Nouveau brasseries. The pot-au-feu is the standout dish. We also recommend the calf’s head, lamb stew, andouillette and boeuf bourguignon. This is the sort of establishment where you can still find traditional French staples like hard-boiled eggs with mayonnaise and céleri rémoulade. The napkin rings may have disappeared, but the atmosphere and sumptuous décor remain unchanged. Expect alert, animated Parisian service.